I stopped by the future location of Migration Brewing yesterday on Glisan just east of SE 28th. 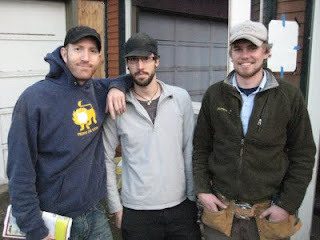 The three co-owners were all there working on the building -- that's McKean, Colin, and Michael in the picture. A kegerator stocked with Lompoc's Fresh Hop Harvest Man helps ensure that the work goes smoothly. There's a lot of work to do to get the building ready, but it will be a nice open room, with high ceilings showing off the original fir rafters. There will be a patio area out front along Glisan. The plan is to open in January, but sometimes the guys say "early 2010", so it wouldn't be surprising if the schedule slips a little. A lot of the details are still being worked out, but in the beginning the pub will open in the late afternoon, and add lunch hours as the business grows. They'll probably allow minors until 8 or 9 PM, but all things are contingent on the OLCC. 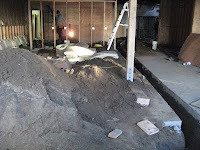 The 7-barrel brewing system is under construction right now in North Portland. Check out Migration's Facebook page for some pictures of it.